Walker Poplar is a hardy prairie tree. 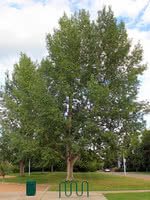 A common shade tree, this fast-growing hybrid poplar works well in urban yards or shelterbelts. In the past, Walker was one of the most popular species used in shelterbelts due to the wide spread that reduced the total number and cost of trees to plant. Despite the fuzz produced by this tree in the Spring it continues to be a popular and cost effective tree for field shelterbelts. Another benefit of this species is the low branching. It can serve as a first row species that traps snow drifts. This makes it uniquely useful as a shelterbelt tree over other varieties. Walker is one of the fastest growing hybrid poplar varieties we grow. An excellent candidate for a shelterbelt, this variety can sometimes be overlooked due its production of fluffy white catkins. Don't let that stop you, this large and lower branching variety is economical and effective.